olivia's version: "mommy, we ate donuts and drank juice. i got a plain one and daddy gave me water, not juice. daddy had a donut too. we sat by kk and christman." mark's version- "it was good. we ate donuts and had juice. then olivia showed me her art work. she is the best artist in her class!" mark's last statement makes me smile. i love that he truly is blind that other children in the world might be more talented or more special than his own children. but i think that is just the way it is supposed to be. :) and honestly, olivia feels exactly the same way about her daddy- no one in the whole wide world has a better daddy than she does!! 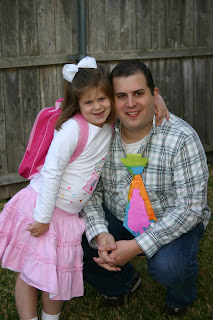 as i took their picture and sent them off on their morning date, i thought about how great their bond is and how thankful i am that olivia has a daddy who loves her unconditionally, that is her biggest cheerleader, and that understands her in a way no one else can- their personalities are SOOO much alike. he always knows exactly how she is feeling and exactly what she needs to hear to be comforted, encouraged, and feel loved. one day olivia will be able to look back and be truly grateful for her daddy and the unending ways that he was there for her, but for now just thinking that he is the BEST daddy in the whole wide world is more than enough thanks and gratitude and one of my greatest joys to watch every single day!! olivia loved her neapolitan cupcake. mmmmmm! 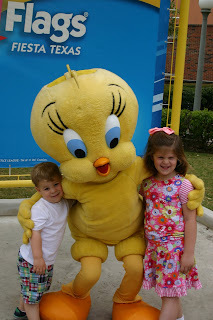 and on saturday we decided to try fiesta texas with the kids. 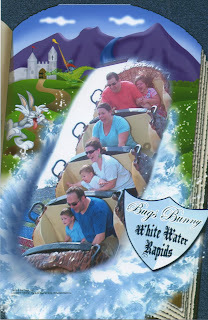 last year we had a great time at sea world, but didn't really want to do that again. we had a really great time and the kids had a blast!! greeted into the park by tweety bird. a great start to a fun day! not sure the official name of this ride, but it was olivia's favorite. 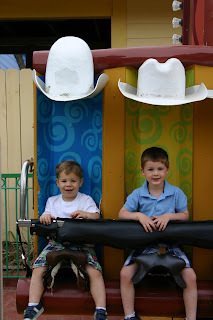 grant and o loved the kiddie roller coaster. this was HUGE for o! we were so proud of her for giving it a try. of course, she loved it!! we all rode the carousel. jack especially loved the ride and the horse he picked out all by himself. it is weekends and get-a-ways like this that recharge my spirit. we left san antonio, driving north on i-35 energized, thankful for deep friendships, and grateful for the chance to get away to laugh, enjoy one another, and make memories together. i was still without a camera for spring break this year, but we did have some fun so i want to make sure i document it. the pictures i do have are all from my photo friend extrodinare- misty! 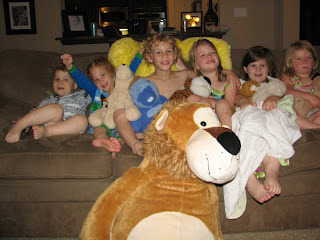 we started out the week with a fun overnight at b and pop's house with the cousins and rara. we packed a lot in 24 hours and had so much fun!!! 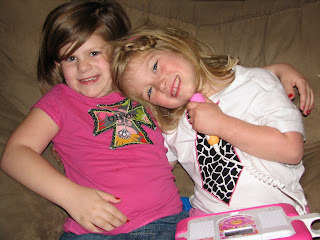 you can click here (sarah's blog) to see pictures from our time. we watched movies in the "movie theater," made s'mores in the firepit in the backyard, played hard, swam in the hot tub and even made a fruit pizza. it was great to have some good quality time with some of our besties and have a fun change of scenery for a couple days. the rest of our week we had planned to spend time with the haynes crew who was driving across the state from el paso. the haynes gang was hit with a fever virus, surprise trip to the er, and some car issues so those plans were altered quite a bit. olivia had been counting down the days until she would see lilli and i was just as excited to see the haynes girls, so we made it work and did get to spend a day with them in allen. i figured the kids were already on antibiotics, we're safe! ha! i know that is not really how it is supposed to work, but oh well. the kids had a blast playing together and i was in heaven sitting and chatting with two of my dearest friends in the whole wide world. whole kid crew! 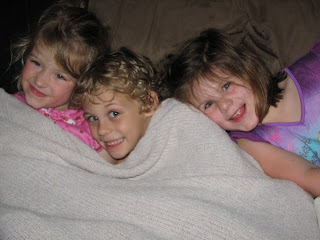 these kids are going to love eachother no matter what! their mama's will make sure of it. in all reality, they really do have so much fun together. "the littles" as we refer to them. 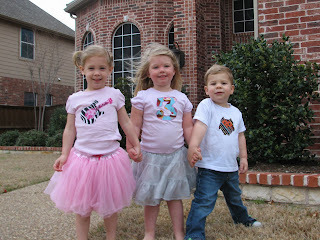 posing in all their moonbeam cuteness. "the bigs" or baby bffs. what a trio they are! for the final days of our break we headed out to the lake and farm to spend some time with my family. it had been so long since we had been able to get away, so it was a PERFECT ending to our spring break. 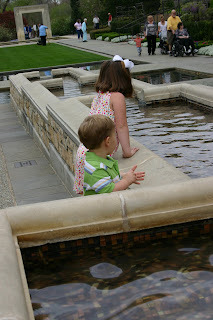 we made another trip to the dallas arboretum this time to see dallas blooms. it was BEAUTIFUL!!! i have lived in dallas for most of my life, have a membership to the arboretum, and yet i have never been when the tulips were in full bloom. we are usually a week or two late with our spring visit to the gardens, but this year it was perfect timing!! i am so thankful for the morning we spent walking around, taking pictures, and playing in the wide open spaces. 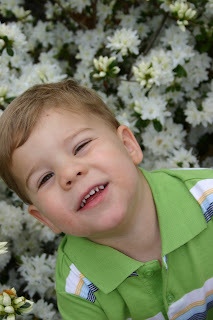 i of course wanted the kids to get all dressed up in their easter clothes so we could get some easter pictures with the flowers as our backdrop. with a little bit of bribery o and j did pose for some pics. i think they look so cute in their pastels. asking them to pose together is still too much to ask, but we did get some good individual shots. nana came too. she is always so helpful when i am determined to get pictures of the kids AND she loves the arboretum, so she is always up for a visit with us. bonus for nana this trip, she got in a few pictures with the kids. they sure love her, if you can't tell from the HUGE smiles on their faces when they are with her. then after pictures, we did a wardrobe change so we could really play and enjoy the rest of our time. jack walking thru the flowers and in no mood to take more pictures!! such a boy!! olivia posing around the pink azaleas. jack in the "jack and the beanstalk" house. olivia reaching for rapunzel's hair. 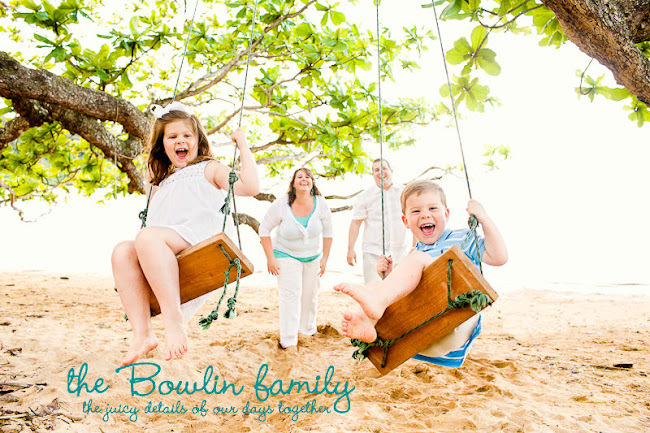 awww, spring is really here and i am so thankful for a fun morning with my mom and my kids. terrible quality iPhone pic, but too cute not to share. the kids and i went out to allen for a special dinner date last night with gram millie. i know i have talked about gram millie on my blog before, but i'll fill you in again. gram millie is my mom's mom, my grandmother, and great-grandmother to o & j. she is an amazing lady. since she doesn't read my blog it is ok for me to reveal that she is 94 years old (i think that is right, it's at least close.) and going strong. she has had a lot of changes in the last several months. she lost her husband (papa terry), moved to assisted living, and moved away from all of her friends. all in all she has handled all the change amazingly well, but she still loves a little extra attention, so we were excited to have the opportunity to get her out of her house and spend some time with her. we had a great evening. she wanted to go to cheddar's, so cheddar's it was. after dinner, she told the kids we could get dessert, so we introduced her to the famous cookie monster. we should have ordered 2 because i think they have shrunk in size and between the 4 of us it was GONE in minutes!! yummy!! i know she had fun because on our way to take her home she was already trying to plan our next dinner date. we dropped her off, said our good-byes, and headed back down 75 toward home. on our way back to our house olivia kept talking about how much she loved gram millie. of course, jack chimed in too, agreeing with his big sister. as they were talking i too felt so grateful for the relationship we have, the love that is shared, and the incredible gift she is to our family.